A multitude of handmade treasures from the deepest of caverns and underwater kingdoms has emerged to forge the Fantasy Artists of Etsy team's newest exhibition. From watercolor mermaids to jewel encrusted starfish to intricate beaded headdresses, you won't be able to resist the siren's call that pulls you from the safety of shore. 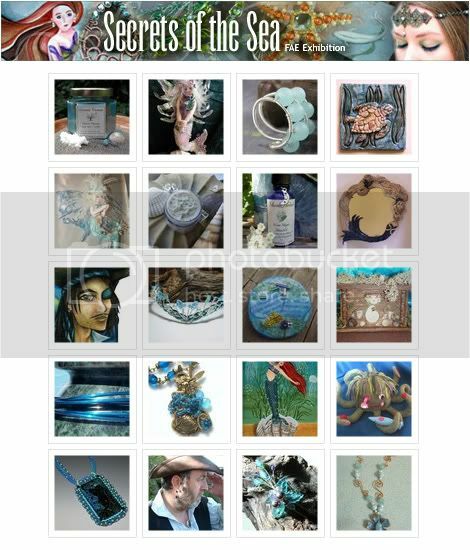 EDIT:Secrets of the Sea Exhibition has been replaced by the next exhibition, but click on the screenshot below to view all the FAE items currently for sale that are tagged with the word "sea." One "Secret Of The Sea" is the Treasure Chest" of talent in FAE. Kudos! Kristen! I didn't think my jewelry would look good water-logged. But definitely hope to be in the next exhibit that I think is Wedding's Themed.